The Esmont community possesses a variety of residential homes built in the 1700's to early 1900 time frame that contain numerous high-style resources that represent commonly found styles as well as a few examples of more unique designs. In the early 1700's, buildings such as seen at Plain Dealing were preliminary dwellings built ca. 1761. 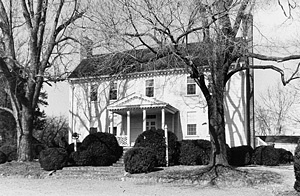 Other more stylistic examples arose in the 1760-1780's such as the multiple-story Georgian-style house built for Walter Coles at Woodville in 1796. Another example of a unique house design evolved in 1761 when Samuel Dyer built a second house parallel to the original home at Plain Dealing and connected the two buildings with an open hyphen in a plan that formed an H-shaped house. 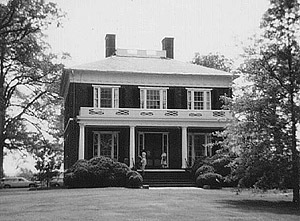 From about 1780-1820, houses such as Tallwood (1803), a Coles family home located on Green Mountain, were built in the Federal style which became the more dominant style throughout America during that time period. The Federal style exhibits numerous classical features but is modest in its interpretation of these features. The Early Classical Revival style in America started in the late 18th century and sought to revert to the original forms used in the Roman and Greek republics. In the Esmont area, many of the details of this style were derived from the 16th century Italian architect, Andrea Palladio (1508-1580). Edgemont was built for James Powell Cocke about 1796, and its design is based on Andrea Palladio's Villa Capra which features four porticos. 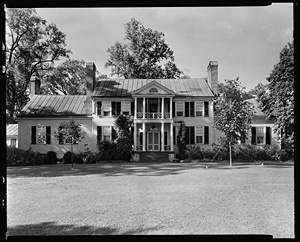 Another example of Palladio's design work is Mountain Grove, built around 1803-1804 for Captain Benjamin Harris in Schuyler. Homes influenced by the Early Classical Revival of the Jeffersonian style includes Estouteville on Green Mountain which was begun in 1827 by John Coles III and Esmont, built circa 1816 for Dr. Charles Cocke. The Greek Revival style, which became popular during the Classical Revival period, includes the circa 1850 brick mansion, Enniscorthy which replaced an earlier dwelling destroyed by fire, with its two-story main block that is three bays wide and a flat-roof portico over its central entry. During the Victorian Era (1860-1900), asymmetrical romantic buildings in a variety of architectural styles appeared in the Piedmont area of Virginia. An example of a Victorian Era home in the Esmont area was Nydrie, a fifty-room brick residence on Green Mountain which was perhaps the grandest home in the Piedmont. Nydrie was a massive, 50-room manor house modeled after a Scottish baronial house on Loch Nydrie in Scotland; Nydrie was razed in 1978. Please click on each image for a larger view and more information. 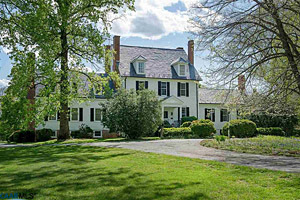 Comments: Edgemont was built in 1796 for James Powell Cocke, a justice of Henrico County, who moved to Albemarle County for its healthful climate as he suffered from Malaria. The design of this home is often credited to Thomas Jefferson based upon the Villa Rotunda design of Palladio. 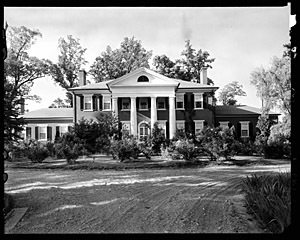 Cocke's nephew, Dr. Charles Cocke, would live nearby at Esmont plantation about two decades after the construction of Edgemont. Comments: The Coles family arrived in Albemarle County between 1730 and 1747. John Coles I (1705-1747), the immigrant, purchased the land on Green Mountain Road as a hunting retreat, later establishing a permanent residence known as Enniscorthy. Coles named this estate for his hometown of Enniscorthy in County Wexford, Ireland. When Coles passed away in 1747, Enniscorthy passed to his son, John Coles II. In 1781, during the American Revolution, Thomas Jefferson fled to Enniscorthy to evade capture by British soldiers. In 1789, a plantation house was built at Enniscorthy, which was destroyed by fire in 1839. The Enniscorthy home shown in this photo was built circa 1850. Comments: The Esmont house was built ca. 1816 for Doctor Charles Cocke, nephew of James Powell Cocke of nearby Edgemont in Esmont, VA. Esmont was a major plantation, and over thirty slaves were held on the property in 1849. The Esmont property once spread over 2,000 acres, but in 2018 it consists of 105 acres. The Lane Brothers, who owned the property at the turn of the 20th century, parcelled off a significant portion of land from the Esmont estate to build an industrial village of the same name. Comments: Estouteville was built ca. 1827 for John Coles, III, and family. A house named "Calycanthus Hill", built in 1800, previously stood on this property. 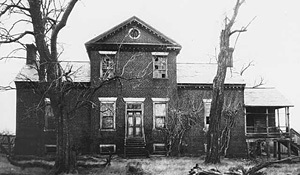 Master joiner James Dinsmore, assisted by brick mason William B. Phillips, built Estouteville immediately to the south of the old house. After Estouteville was built, the older house was converted to an orangery and burned in 1856. James Dinsmore had previously served as Thomas Jefferson's master carpenter for ten years, and Estouteville was one of Dinsmore's crowning achievements. Estouteville is noted for its grand Tuscan exterior porticoes and great interior hall with an elaborate Doric frieze. Comments: Guthrie Hall was built ca. 1901 for John Guthrie Hopkins, a Scottish-born, self-made copper magnate who came to Virginia to pursue his hobby of restoring old houses. The house was designed by Frederick Hill, an architect with the firm of McKim, Mead, and White. In addition to the fine interiors of the main house, the Guthrie estate included a private railroad station and a bowling alley. Comments: Mountain Grove in Schuyler was built in 1803-1804 for Captain Benjamin Harris, a soldier in the Virginia State Militia during the Revolution and a magistrate in 1791. 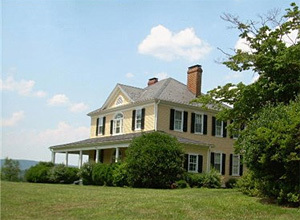 Mountain Grove was built in the classic Virginia Palladian style. Its tripartite form is composed of a two-story, three bay center block flanked by single-bay, 1 1/2-story wings. Strongly Jeffersonian in design, Mountain Grove is not unlike the earliest designs for Monticello. Comments: In the 1890's, Harry Douglas Forsyth purchased the Tom Coles Farm at Green Mountain in southern Albemarle County, Virginia, and it contained some seven hundred acres of land. Forsyth was a British-born financier and sugar baron who had moved from New Orleans to southern Albemarle with his wife, Sarah Rice Johnson Forsyth. 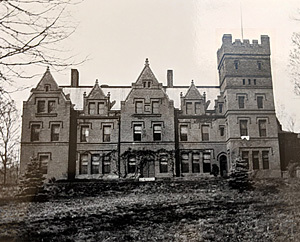 By 1898, the Forsyth commissioned the building of Nydrie, a massive manor house modeled after a Scottish baronial castle Nydrie contained fifty rooms, not including hallways and the basement. An equally immense set of stables and several good houses for estate workers had been built on the Forsyths' property prior to erecting the Nydrie house shown above. Comments: Woodville was built in 1796 by prominent Virginia planter John Coles, II, of nearby Enniscorthy. Coles built this two-story, double-pile frame house for his son, Walter Coles (1772-1854). An addition was made to the west side of this house in 1832. According to photographer, Frances Benjamin Johnston (1864-1852), who worked for the Carnegie Survey of the Architecture of the South, four generations of Coles occupied the house from its completion until the Coles sold the Woodville property to Charles Shaw in the late 1800s. Shaw renamed the property. The Coles, meanwhile, built a new home, giving it the same name as their former property, Woodville. Later, the Coles family rebought the first Woodville property, and, to distinguish the two Woodvilles from each other, they referred to the 1796 house as 'Old Woodville.' 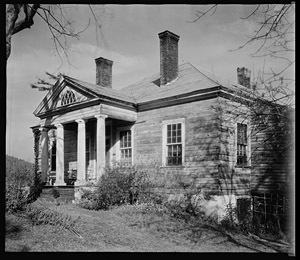 Old Woodville is located at 6774 Green Mountain Road in Esmont, Virginia. Comments: Tallwood, located on Green Mountain near Keene, was built in 1803 for Tucker Coles (1782-1861) and his wife, Helen Skipwith Coles. The Tallwood estate is one of three family estates carved from the original tract of land belonging to John Coles II (1745-1808) of Enniscorthy. The account book of John Coles II mentions that he insured Tallwood against fire in 1805. Comments: The Tros-Dale Home for Boys is located near Keene, Virginia, and its building was completed in 1966. Peter T. Way was the founder and Director of the Tros-Dale Home. 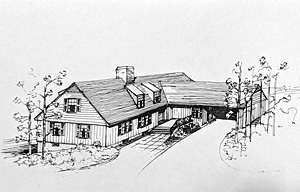 Director Way's goal was to provide a small, family-oriented home for boys rather than one of the large children's institutions that were in existence in Virginia in 1965. He succeeded and had a strong and lasting influence on the lives of many boys during his Tenure as Director of the Tros-dale Home. 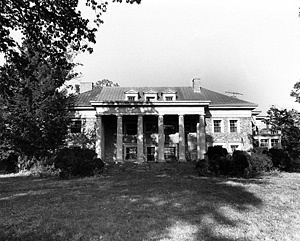 The Tros-dale Home for Boys relied greatly on philanthropy for its funding and remained in existence until the early 1980's. Comments: When Peyton Skipwith Coles sold Tallwood to William D. Waters in 1897, he reserved about 184 acres on the north side of Tallwood next to the Enniscorthy estate running from Green Mountain Road almost to Sand Ridge Road. In 1903-1904, Coles erected a new dwelling house on this acreage with necessary out-buildings and farm buildings, and he called his new home 'Coleswood.' 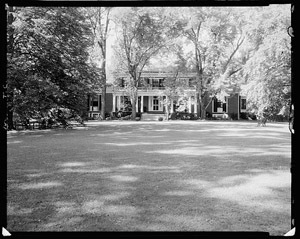 The Coleswood lawn runs up to the woods which screen the house from the Green Mountain Road, and it is because of these woods that the house takes its name. The front gate at Coleswood, which is a double gate made of iron with granite gate-posts, was formerly the front gate at Estouteville. The Coleswood dwelling house was remodeled in 2004. In 2018, the Coleswood property, located at 6198 Green Mountain Road in Esmont, is the property of the John C. Pierce Farm, Inc., and the company's registered agent is J. Paula Pierce.